This is the campaign log for the Seventeenth session of a google+run Wandering Heroes of Ogre Gate campaign. The previous session is described HERE. Note: This session focus on the actions of San and Chen at the Ogre Gate Inn. Last session Chen had overseen defense of the Ogre Gate Inn against the attack of General Dee and Prince Yuan. With the help of their Kailin riders, he was able to defeat the general, kill him and take Prince Yuan prisoner. San soon arrived to aid him in his efforts. After killing General Dee they sent Bronze Master to replace him, using Shift of the Chameleon. He sent them word that the King of Li Fan was going to advance south against them with an army of over 70,000 men. That morning Chen noticed small shrubs growing all around the inn. Examining the shrub he saw their branches looked liked human muscle tissue. By evening the entire region was engulfed in a sea of trees, except their branches were like fleshless arms and their trunks, warped faces. The trees screamed and attacked the Kailin encampment, forcing them to retreat to the inn. Chen approached one of the trees and tried speaking to it. It told him they had appeared as punishment for their betrayal from Qinwen Master of the Seven Talismans. It told him that the trees would bring their doom, but Chen ordered his men to burn a path through the trees (which seemed to work). They found they could keep areas clear if they continuously burned the trees down. Chen then went to speak with Zhang Kang the creature living in the tunnels below the Inn. He asked Zhang Kang about Qinwen and the Talismans, if there was any way to defeat them. Zhang Kang told him that Qinwen possessed seven out of ten Dragon and Phoenix Talismans (pairs of two). The Talismans were physical manifestations of the fundamental elements of creations, a sort of primitive expression of the Enlightened Goddesses creative and destructive will. The Dragon Talismans could create provided a sacrifice was made, the Phoenix Talismans could destroy provided someone paid the cost by creating something new or performing an important deed. Having a pair gave one more control of that cost. 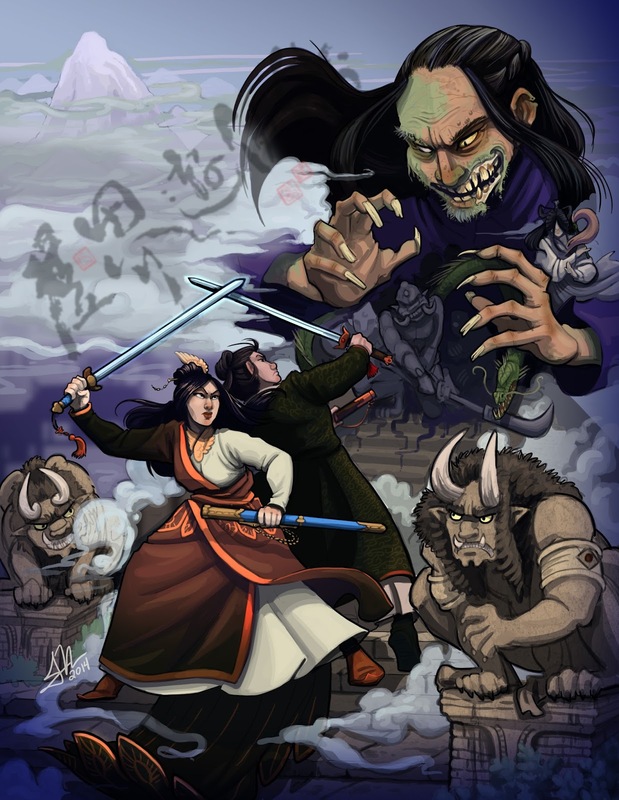 Qinwen killed the original owners of the seven Talismans, member of an ancient sect called Pure Phoenix. Now only three members of Pure Phoenix Remained, each guarding one of three Phoenix Talismans. According to Zhang Kang the three sisters were crazed and violent, living unnaturally long lives and descending into wickedness over the centuries. However he suggested that Chen could steal the Talismans from them or work with the sisters. That might give him some chance against Qinwen. Retreat was also a viable option at this point in Zhang Kang's view. Chen asked Zhang Kang where the sisters were and he told him they resided in caves at the base of a Mesa in a land called Bone Kingdom, about two days to the west deep in the badlands of Yao. Chen took the Venom of Zhaoze with him to go scout the region. He also brought forty Kailin Soldiers. On their way to the mesa they found an endless field of bones in the surrounding flatlands. On their approach, a giant creature with the spine of a colossal snake and head of huge Markhor rise from the rubble attacking the Kailin. With its tail it smashed dozens of them against the ground, leaving a trail of broken bodies. It also gored the Venom of Zhaoze in the shoulder. The remaining Kailin moved away from the creature, while the Venom of Zhaoze leapt on its neck and began to pound its head with his fist. Chen used Blast of the Dragon to move the snake away form his men. It made several more attacks but the Venom of Zhaoze eventually shattered its skull and it collapsed. Chen tended to his men. In the end they twenty three of the original forty remained. They moved on, heading toward the mesa. Examining the entrance they saw two caves and a balcony. Chen went to the balcony and used his lightness kung fu to leap upon it. Venom of Zhaoze followed. The balcony lead into a cave but was guarded by scaled dogs that barked and growled at them. Chen stepped forward and said he would like to speak to the master, that he knew where the other talismans were and could help them retrieve them. Within seconds a beautiful woman with a butterfly hair pin appeared (the butterfly was notable because it was the Butterfly Moon). Upon seeing her, Chen fell in love, clearly enchanted by some kind of magic. She agreed to speak with them in her library telling them her name was Liling. Chen said he needed her help against Qinwen and that he would work with her to help her recover the remaining Talismans. She agreed to the suggestion on the condition that he stole the other two talismans from her sisters first (she explained that her sisters lived in different sections of the caves, were hideously withered and evil). If he succeeded, she would tap their power to help him and they could work out an arrangement. Chen agreed but said he needed a few days. He wanted to go back to the inn and get some help.